Each summer Rochester Contemporary Art Center’s 6x6 exhibition brings together thousands of original artworks, made and donated by celebrities, international & local artists, designers, youth and YOU. Each artist may enter up to four artworks of any medium (2D or 3D). Artworks must be six inches square and signed only on the back, to be exhibited anonymously. Participation is free. All artworks will be exhibited and for sale to the public for $20 each to benefit RoCo. Artists’ names will be revealed to the buyer upon purchase and all artworks remain on display through July 16. Limit four artworks per school or school group (no limit for colleges). 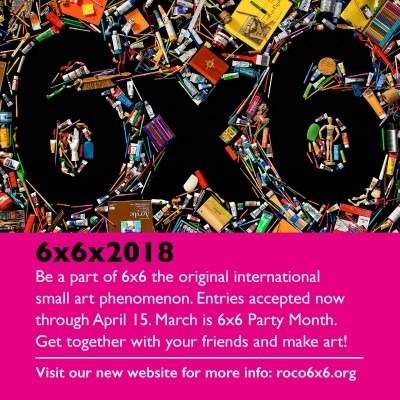 Be a part of 6x6, the original international small art phenomenon. Entries accepted now through April 15. March is 6x6 Party Month. Get together with your friends and make art!